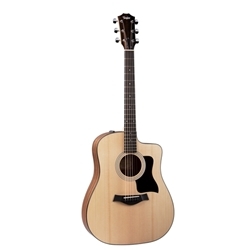 Serving South Florida musicians, DJ and engineers in the Ft Lauderdale and greater Miami area Taylor's 100 Series makes a great guitar-playing experience accessible to everyone with these real wood instruments. For people taking the first or next step in their musical journey, these instruments promise to accelerate players' growth and enhance their enjoyment. Taylor's famous neck profile combined with a 1 11/16-inch nut width make it easy for developing players to form barre chords. All 100 Series models include a durable, 600-denier nylon gig bag with double-stitched seams and reinforced stress points, built by Taylor for an optimal fit. Tone Woods A guitar's top is the primary filter and distributor of vibrating string energy through the guitar, which means it has a huge impact on its sound. Sitka Spruce is the most prevalent guitar top wood of the modern era. It blends stiffness and elasticity in just the right proportions which translates into broad dynamic range with crisp articulation. Layered Sapele back and sides create a sturdy yet receptive platform for the vibrating string energy sent by the guitar's top. Layered wood is less susceptible to changes in temperature and humidity, making it an excellent choice for players who travel with their instruments or simply require more durability.